Over the weekend, petty London council bureaucrats tried to stop fans camping outside the All England Tennis Club to buy tickets to see their tennis heroes. 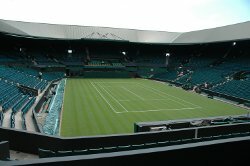 Traditionally, fans who did not have tickets for the Wimbledon Tennis championship queued out usually overnight to buy one of the 1,000 “first come fist serve” tickets for the centre and No1 courts. However, this year the local Merton Council decided that camping on the pavement breached their Health and Safety guidelines and so tried to evict the street campers. Amongst the potential evictees were 4 friends who arrived 60 hours ahead of the first match! Thankfully sense was served up by the All England Club who intervened on behalf of the un-happy campers and secured their right to camp out for the “hens teeth” tickets. By last night (Sunday) approximately 1,000 people were camping outside Wimbledon. Lets hope the weather is well behaved so none of our camper friends get wet waiting and also so we don’t get Sir Cliff singing in the rain!